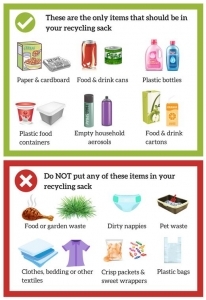 You’ll hear a lot of different ideas from people about what does and doesn’t go in your clear recycling sacks. Over time the technology has changed, leading to changes in what can and can’t be recycled. The image to the right is Milton Keynes Council’s official guide to what should and shouldn’t go in. Paper and cardboard can go in the clear recycling sack, although cardboard must be dry and should not be left for collection separately. 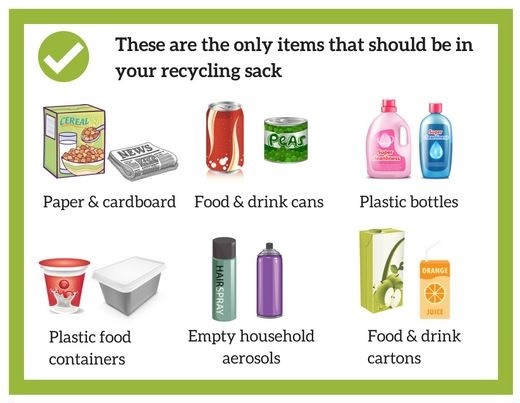 Also recyclable are aluminium cans, plastic bottles and food containers, empty aerosol cans and food/drink cartons. Items that cannot be recycled and should go in the black general waste bag include nappies, clothing and textiles, food wrappers and plastic bags. Food waste and other organic material should go in the green garden waste bin.